Vampire Mob started as a live-action series with two seasons but after the loss of cast member Marcia Wallace (Mrs. Krabappel on "The Simpsons") I'm adapting the season three script into a series of comic books, this being the first of nine issues that are written. The art is by JM Ringuet, creator/writer/artist of "Repossesed" (Image) and Eisner and Harvey nominated Deron Bennett, who is also the writer of "Quixote," did the lettering on Issue 1. Both will return to work on Issue 2. I started writing this story in 2009 and will continue to tell it as long as the audience continues to want more Vampire Mob. You can watch the first two seasons of Vampire Mob at VampireMob.com. Hi! My name is Joe Wilson and I tell stories to a small, worldwide audience who help make them happen. I live in Los Angeles with my wife, KZ and my cat, Mike. 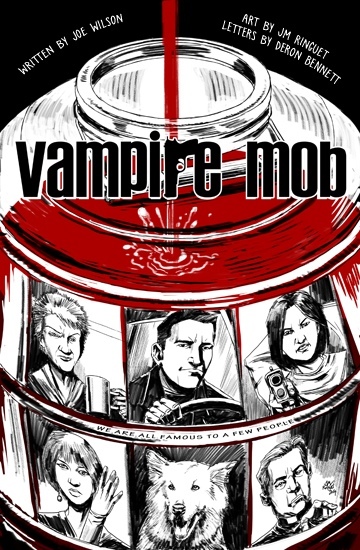 Vampire Mob is my first comic book/graphic novel and I love telling stories in this form! If you would like to see stories I've made as a writer & director, there are two seasons of Vampire Mob on VampireMob.com and five episodes of PlayShorts, which is an anthology series, PlayShorts.com.